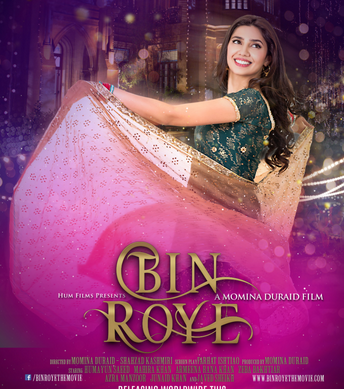 I was lucky to watch the amazing new Pakistani movie Bin Roye in the cinema last night. Lucky on so many levels: my kids went to sleep on time, I had amazing friends to watch the movie with on a weeknight, a supportive husband for my last-minute plan, I was lucky to live in a Canadian city where the movie was released in and most importantly I had a ticket beforehand, because the movie was sold out- yes, on a Tuesday night and may I add a Tuesday night with a tornado warning. The movie is a visual, aesthetic and nostalgic delight. It’s the experience you want to have when you go to the cinema. A larger than life experience that helps you transcend the worries and logistics of the day you spent, and explore a world the movie takes you in. For me, this movie is the Pakistan that I love. The Pakistan of doting family, eid bangles, darling dadi (grandmother), sister love, road-side-flower-shops, dholkis-on-shadis, gorgeous-joras, big-flying-dupattas and loving-househelp. Yes, we do love Bollywood, and it’s in a language we understand but Bollywood can never give us what a Pakistani film can, simply because Bollywood is not from Pakistan. Bollywood can never capture for us the essence of home and our unique Pakistani culture. Home which is eccentric but ours, where the dadi (grandmother) prays with an aqeeq in her finger, the mother gasps “hum mehmanoon ko kya kahein ge” and a two-year-old boy goes regularly to school. A world where we can relate with Saba’s teenage cousin crush, her emotional anguish and guilt, Irtiza’s misleading flirtatious gestures within a protected family setting, Saman’s sweetness, Dadi’s wisdom, the men in crisp white kurtas, the malmal dupattas and the house-help’s dialogues. These are all people we have seen or met. And that’s why good cinema is so important for a country and its culture. It helps preserve and nourish it. Bin Roye is pleasing on the eyes with the beautiful dresses, pretty faces and amazing locations. This is no surprise for anyone who grew up in Pakistan. These are dresses we see on an everyday basis or special occasions, people we meet or maybe are ourselves and the places where we have lived or been to. But when you see it all together, on a big screen, accompanied by some of the most beautiful voices Pakistan has produced like Abida Parveen and Rahat Fateh Ali, the beauty of the Pakistani culture warms your heart. Bin Roye and all the recent releases are a big deal because the Pakistan film industry has a chance to flourish again. For my generation this is the first actual revival. By the time I was born most big cinemas had been transformed into marriage halls. The few that survived were run down and showing movies that middle-class families could not relate to. My parents always talked lovingly about the cinema days of the 70s when they enjoyed Nadeem, Zeba and Waheed Murad’s movies. The first movie I saw as a child was in an airforce base (badabair) in Peshawar. We were visiting family and Javed Sheikh’s Zanjeer (1986) was showing. I have a fading memory of running to the screen every so often and being pulled back by my parents because I had never seen images dance on a screen before. When Shaan and Reema’s Bulandi (1990) was launched we went to a cinema on Murree Road in Rawalpindi to watch it. My father booked a family box for us for some privacy and maybe because he hoped the seats were better. We watched the entire movie with our feet up, knees hugging the chins, after we heard a few mice scurry across the floor. Still it was a memorable enjoyable experience for us. There were no popcorns but my father brought fresh fish from a nearby vendor and I still remember the distinctive sound the coke vendor made at intermission, by sliding the bottle opener across the bottles to attract the cinema-goers. There were a few good Pakistani movies in between but these were one off. The Shoaib Mansoor movies “Khuda Ke Liay” and “Bol” were beautiful. But these were serious movies about grave issues. Very important cinema but all of us yearned a good Pakistani movie we could enjoy and laugh with. (There were a few enjoyable movies, released primarily for TV from which one of my favorite is the Fawad Khan, Aaminah Sheikh and Vasay Chaudary starrer “Armaan” remake.) And then 2014 happened. A series of hits like “Waar” and “Na Maloom Afraad”, and so many more in the pipeline are the beginning of something significant. Pakistani cinema is attracting talented educated people who had been working in the extremely successful Pakistani drama and advertising agency. It’s upto us the audience now to support these efforts because every country needs its own movie industry. It’s good for competition, for the region, for peace efforts and most importantly for our own culture. I can criticize the movie if I want to. But I would be nit picking. The fact is that I along with everyone else in the houseful cinema, left with a smile on our face and a triumphant: “kitni achi movie the“, “maza aa gaya” to each other. The music is world class. The actors are brilliant and the story is from within us. So go out and buy a ticket. Buy the music legally. Show support. Introduce the movie to your children in age-appropriate ways. Pakistani cinema I’m so excited for you! Superb!!!! Details are so clear and easy to understand….May God bless you more strength in your power of writing….keep writing…Proud of you my dear Tamania…. Awesome review. Loved the movie. I am not a person who always looks for loophole, This movies has some serious loopholes but most of things were so breathtakingly beautiful. Music, cinematography and mahira khan were stunningly awesome. Pakistan industry is still in its early stage and we better not expect miracles. We should support these guys and surely we will watch some awesome movies in future. Thanks for your comment Haroon! Glad you enjoyed the movie and the review! Keep visiting Urdu Mom! I live in Oslo, Norway, and I am very excited to watch this movie on Saturday. Pakistanis here are also very excited to watch this and the tickets for the evening shows today are sold out. The best part of you review is that we should appreciate their efforts and support pakistani cinema, even though it can be some flaws. We have to show the directors and producers that there is audience who wants to see the movie. So happy to hear that there is great buzz in Norway for the movie also! and Yes, its so important for us to encourage Pakistani cinema because it’s important for us! Do tell me how you like the movie? I went and watched it again today! Even though there were some flaws, nobody made a big deal out of it. At the climax people were clapping and said: ´movie achi thi & pakistani cinema is back´. So we are happy here too and excited for new upcoming movies. Thankyou for a superb review. I love and share your passion for pak cinema. Thanks so much for your comment! I’m so happy to hear about your support for Pakistani Cinema. So many more exciting movies coming up! Quite Beautifully reviewed ! Dear how can I contribute to Your Blog ? Watched many times and still one of my favorite and also one of the best movies of Pakistan. i love this drama cast.. my favorite Humayun Saeed and Mahira Khan create history insh alllah … best of luck hum tv Humaun saeed , Mahira khan ,Momina Duraid..Pakistan No 1 channel is HUM TV No doubt .